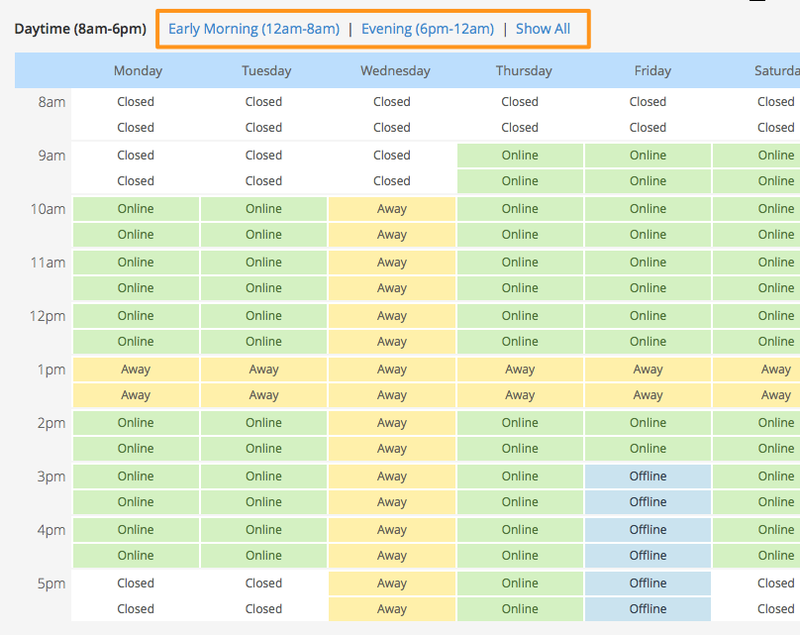 When you first come to a Staff Hours page, you'll see that each time slot during which your business is open is marked "Online" and the times when your business is closed (based on your Operating Hours) are marked "Closed". Online (green) - Mark a staff member "Online" when he/she is working, and taking online appointments. If you want a client to be able to book a certain staff member at 10am, make sure he/she is available at that time. Tip: A staff member must be Online for the entire duration of a service in order to be available when a client selects that service. For example: If a staff member is only Online for 30 minutes at a time, then Offline or Away in between those Online times, she won't be able to take 60 minute appointments. So, be sure to make the staff member Online for as many back-to-back time slots as they'd need to provide the services they offer. 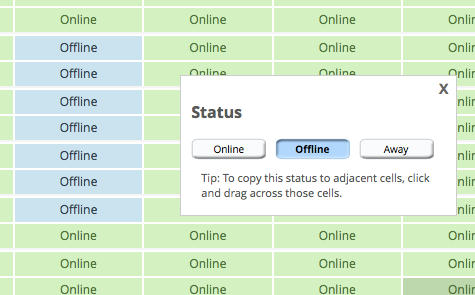 Offline (blue) - Mark a staff member "Offline" when they will be at work, but not allowing online appointments. This can be because they're performing other tasks (paperwork, etc. ), or to allow appointments to only be booked internally (offline). Away (tan) - Mark a staff member "Away" when he/she is not working. This can be used for days off, lunch hours, or times before/after a staff member comes into work. TIP: Change the status on multiple time slots by clicking on a time slot you've already edited, holding the mouse button down then dragging the mouse (or your finger on a trackpad) in the direction you want to bring the change. You can move up, down, left, right or diagonally. 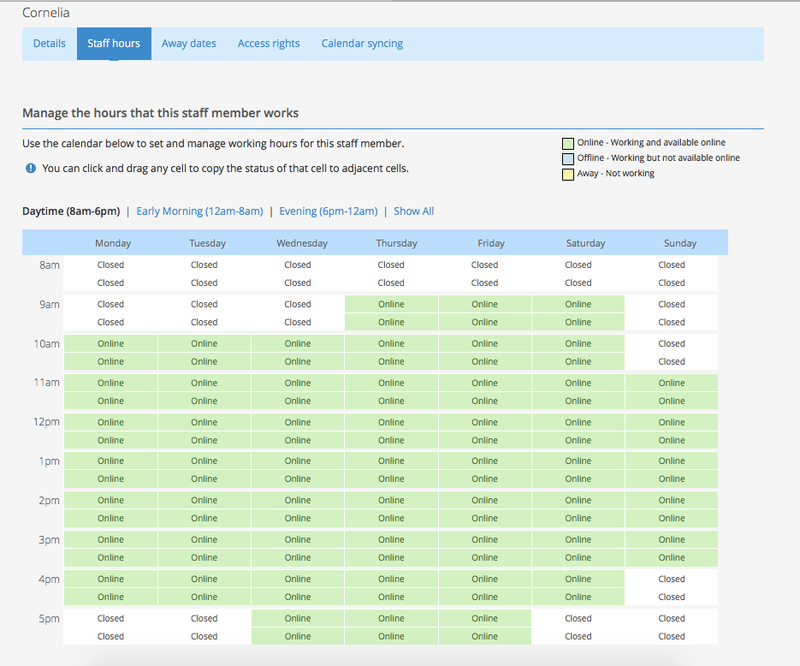 It is also possible to actually override your Operating Hours on a per-staff member basis. 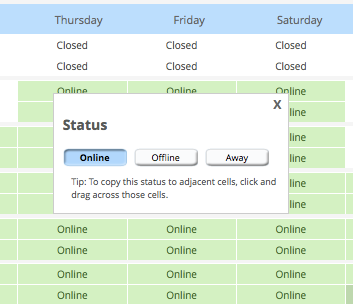 When you click on a Closed time slot, you will have four options: "Closed", "Online" "Offline" and "Away", with "Closed" automatically selected. Click "Online" to make that staff member available at that time, even though your business is not technically open. Clients will see the time slots as available, but they will also see your listed "Business Hours" that match your Operating Hours. 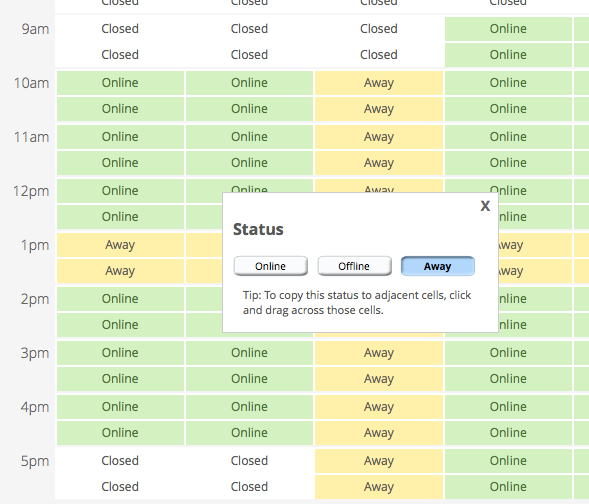 TIP: Be sure to double-check the Staff Hours for all the relevant time ranges that your business is open. The default view is be "Daytime (8:00am - 6:00pm)". If your business is open before 8:00am or after 6:00pm, remember to adjust the hours for the Morning and/or Evening times as well. By the way, you can easily override any of the settings mentioned above, directly in your calendar, if you need to deviate from the weekly schedule once in a while. Check out our instructions on overriding availability right in the calendar.